Designing employee pensions involves more than a traditional debate between defined-benefit and defined-contribution plans. Both types of plans have inherent advantages and disadvantages. For the record, defined-contribution plans have suffered asset downturns over the period studied as well. Any such losses are the responsibility of the individual participant, however, rather than current and future taxpayers as a group. 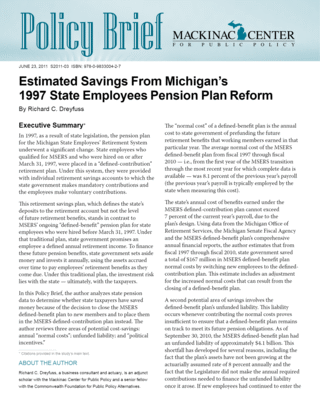 The calculations in this Policy Brief suggest that since the advent of the MSERS defined-contribution plan in 1997, Michigan taxpayers have saved approximately $167 million in lower pension normal costs and between $2.3 billion and $4.3 billion in lower unfunded liabilities. An additional and important advantage, though difficult to quantify, is the reduced political temptation to provide benefits whose costs are largely deferred to future generations. In other words, a defined-contribution plan is less prone to potentially harmful political interventions. Using [our] return forecasts, none of the 126 state retirement systems are expected to earn long-term asset returns that equal or exceed their actuarial interest rate assumption. Wilshire further concludes that the median long-term asset return for the 126 state pension plans would be approximately 6.5 percent — 1.5 percentage points less than Michigan’s 8 percent return assumption. The key point is this: If MSERS’ current actuarial valuations were to be recalculated using lower investment return assumptions, then the unfunded liability and annual required contributions for the MSERS defined-benefit plan would be higher. Thus, the cost savings calculated in this Policy Brief for switching new employees to the MSERS defined-contribution plan could be materially higher. The magnitude of the increase, of course, would depend on the precise return assumption used. The nature and amounts of any future savings will depend on actual investment experience and other factors, including funding policies. Regardless, common sense and the calculations in this Policy Brief suggest that Michigan government should follow the demonstrated best practices of the private sector with regard to employee pensions. In the private sector, pension costs are now designed to be current, with no unfunded liability; predictable, with easily computed expenditures for coming years; and affordable, with annual costs between 5 percent and 7 percent of payroll. [†] The MSERS defined-contribution plan achieves these objectives and can thus serve as a model for reforming other government pension systems. In fact, the normal cost of the program is only part of the annual cost; another portion is the annual payment on the unfunded liability. Hence, the normal cost does not represent the full cost of the plan. Indeed, if the normal cost were considered an absolute measure of the true cost of the MPSERS defined-benefit pension plan, the plan would not have an accrued unfunded liability of nearly $12 billion [now $17.6 billion]. See Richard C. Dreyfuss, “Michigan’s Public-Employee Retirement Benefits: Benchmarking and Managing Benefits and Costs,”(Mackinac Center for Public Policy, Oct. 25, 2010), 13-14, http://www.mackinac.org/archives/2010/S2010-05.pdf (accessed April 16, 2011). [†] See Dreyfuss, “Michigan’s Public-Employee Retirement Benefits: Benchmarking and Managing Benefits and Costs,”(Mackinac Center for Public Policy, Oct. 25, 2010), 8-11, http://www.mackinac.org/archives/2010/S2010-05.pdf (accessed March 28, 2011).